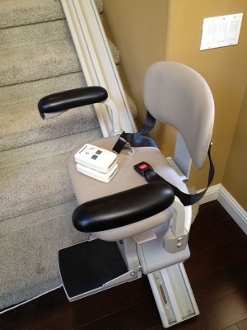 Price includes a used stairlift and normal installation in a typical home. Models and brand may vary depending on availability. Bruno Independent Living Aids is pleased to offer three distinct models in our industry-leading Straight Rail Stairlift line. Two models are for indoor use, and the third, the Outdoor Elite Stair Lift, provides all-weather access to your front door, deck or other exterior accessibility need. Stairway lifts can have numerous features, appropriate for your individual needs and budget. As North America’s largest producer of indoor stairlifts, and an ISO-9001 Certified manufacturer, Bruno ensures that whichever stairlift you select for your home meets the highest standards of quality and durability. Decades of experience translate into superior knowledge and understanding of your needs, met through the finest innovative designs. So, when the day comes that you decide you want to enhance your home with a stairlift, proceed with confidence! Bruno stairway lifts will provide you with years of dependable performance. Any of our dealers across the nation (and around the world) will be happy to explain the specific features of each Bruno stairlift. Remember, if it’s Bruno built, it’s built to last!